#LiveLoveRemodel Blog — A. Caspersen Company Inc.
A common question and concern is window condensation. You may notice moisture on your windows on a cold winter day (“sweaty windows”) and typically the first thing people do is blame their windows, you shouldn’t. Let us explain to you the causes behind your “sweaty windows” and understand how we can fix this. Condensation occurs when water vapor (a gas) turns into water droplets as it comes into contact with a cold surface. The point at which this happens (called the “dew point”) depends on the temperature and humidity of the inside air. The warmer the indoor air, the more water vapor it can “hold,” and moisture can better remain in the vapor state. When air moves next to a cold window, the temperature drops and it can’t “hold” as much vapor. That’s when you start to see condensation forming. Why is there condensation on the inside of my windows? Excess humidity (indoor moisture). A surface that is cooler than room temperature is more likely to show condensation. Condensation is generally seen first on windows and sliding glass doors because they tend to have the lowest temperature of any of the visible surfaces in the house. What should the humidity level be in my home? Every homeowner should own a hygrometer that measures temperature and relative humidity (RH). The ideal relative humidity for health and comfort is about 30–50%. In the winter months, it may have to be lower than 40% RH to avoid condensation on the windows. What happens if I have too much humidity? Do drapes and window shades cause window condensation? No, but drapes and other window coverings can restrict the flow of warm room air over glass surfaces. Therefore, condensation is more likely to occur when drapes are closed and shades are pulled down. Does condensation occur only in winter? Usually, but it can occur during cold weather anytime, and occasionally it will form on the outside of windows on hot, humid summer days, when your air conditioner has cooled the glass. Why is there condensation on the outside of my windows? Outside condensation results from unusual conditions when the air outside is slightly humid and warmer than the temperature of your window glass. This can occur when the weather is neither warm nor cold. 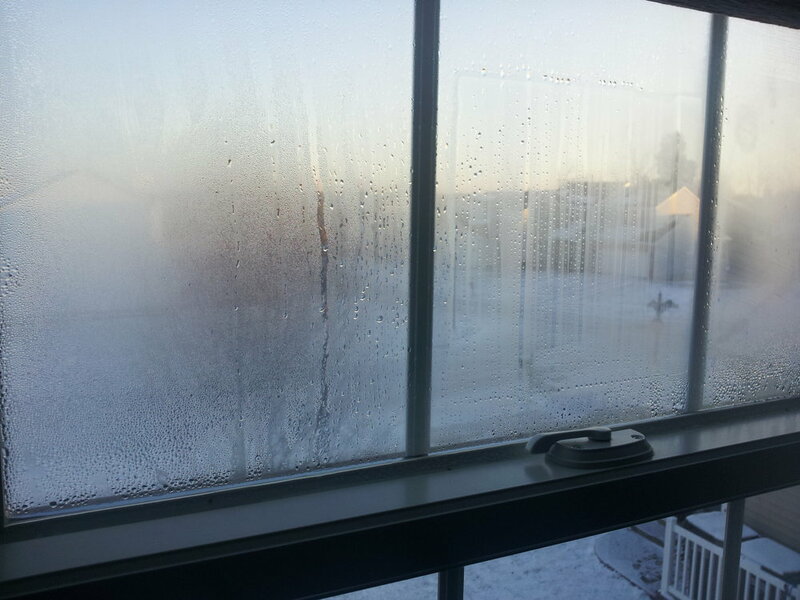 Outside condensation means your windows are not allowing any heat transfer. So if you have some fog on the outside of your windows, you can relax. Your windows are just doing a good job of insulating your home. What about condensation in between the panes of glass? This may indicate a seal failure, and you should contact your window dealer, as this is covered by your warranty. How should I reduce condensation? Run a dehumidifier, don’t run humidifiers. Run the fan while you shower (or open a window). If you have a hot air furnace, install an outside fresh air intake so that high humidity interior air is not being pumped back into the house. Use exhaust fans in the kitchen, bathrooms, and laundry. Make sure you have adequate attic ventilation. Energy efficient windows will have a higher condensation resistance rating (shown on NFRC label) because of the technology of double pane glass and insulation factors. However, if the humidity is too high in your house your windows will still show condensation.